Home / Cartoons / "Language, like love, has to risk something if it’s actually going to mean anything." 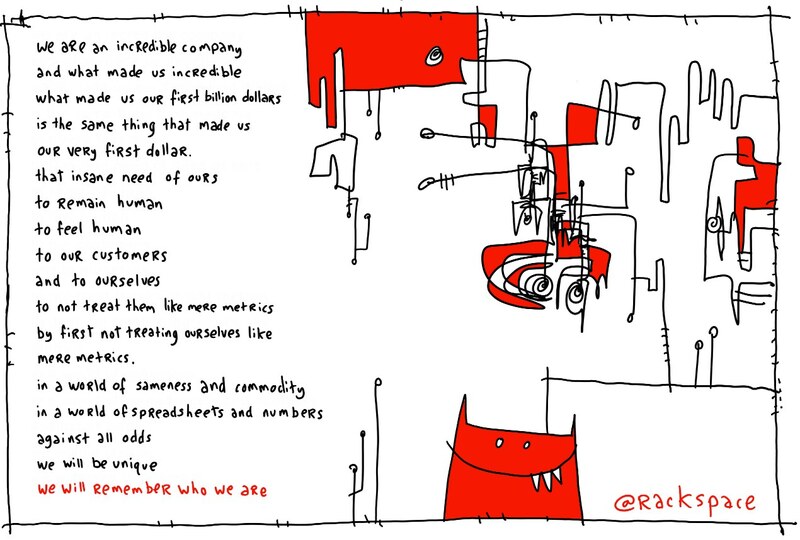 Here’s a cartoon I did recently, that I understand got a lot of love internally at Rackspace. A pledge by the company to maintain its humanity, in spite of what has been insane growth over the last couple of years. To an outsider, it’ll mean little. To somebody inside, the hope was for it to really resonate. Resonate, as opposed to just parroting the usual corporate-speak. Language matters. Language, like love, has to risk something if it’s actually going to mean anything. Or else you’re just parroting. Then again, you don’t want to say anything that you or your shareholders will one day regret, even if you had the best of intentions. It’s the razor’s edge that smart companies must learn to walk along, if they wish to remain smart companies.